Chris holds a B.Comm., M.Comm. and a H. Dip in Ed., all from NUI Galway. He has taught in a wide range of information systems areas and has contributed significantly to the development of the information systems discipline at the university. Chriss research interests lie in the areas of systems analysis and design, Web systems development, usability and information systems ethics. 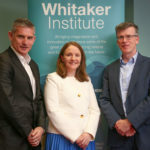 He also has significant consulting experience, having worked on systems development and training projects with firms such as Bord na Mona, Bank of Ireland, Envision Marketing Consultants and Fintrax Teo. Currently he is Programme Director of the M.Sc. in Information Systems Management and a member of the post-graduate course board. Chriss research agenda has developed over the years and he maintains a keen interest in contemporary Information Systems issues. His main current research efforts are in Web development techniques, usability and Information Systems ethics. (2016) Lecture Notes in Information Systems and Organisation: Transforming Healthcare through Information Systems. (2017) Lecture Notes in Information Systems and Organisation: Complexity in Information Systems Development. (2014) Information System Development / Improving Enterprise Communication. (2013) Building Sustainable Information Systems. (2000) A Report on Multimedia and Web Technique Usage in Ireland. Chris has taught for more than twenty five years in a wide range of information systems topics to under-graduate and post-graduate students, including Web and multimedia systems development, management decision systems, systems analysis and design techniques and methodologies, information systems management, enterprise systems and information systems ethics.